1. Aaron Rodgers told Packers fans to R-E-L-A-X about the team’s offense. On Sunday he put last week’s frustrations at ease with a brilliant performance at Soldier Field. Rodgers was throwing strikes from the outset. He finished 22-of-28 passing for 302 yards and four touchdowns. The quarterback wasn’t pressured all day and picked apart the Bears’ secondary with the precision of a heart surgeon. 2. Jay Cutler provided another Jekyll-and-Hyde performance. In the first half the Bears’ signal-caller was on target and keeping pace with Rodgers. The Bears moved the ball at will. But Cutler is gonna Cutler. He threw a ball over the middle at the end of the half that was ruled just short of the goal line, costing a chance at points. In the second half, a frustrated Cutler began forcing passes. He had back-to-back interceptions that killed drives (one on a miscommunication). He was relieved by Jimmy Clauson for the final drive. 3. It was a wacky game all around. There were zero punts (just the second time in NFL history). The teams combined for 854 yards of offense (Packers 358; Bears 496). The Bears attempted an onside kick in the second quarter (they weren’t slowing Rodgers, anyway). And to wrap it up, the Packers had a short field goal blocked late in the game. 4. The Bears’ defense got zero pressure on Rodgers all game. Undoubtedly, Jared Allen being out with pneumonia hurt some, but the lack of pressure has been an issue for most of the season. It was rookie corner Kyle Fuller’s worst game. 5. The Packers’ defense didn’t play well, either. Their pressures didn’t get to Cutler early. The interceptions were both right-place-right-time situations. Clay Matthews didn’t look full-go and it was apparent on his interception return. 6. Once again, Eddie Lacy couldn’t get much going on the ground (17 carries for 48 yards with a 2.8 average). Run-blocking remains an issue. The receivers, however, made up for it. Jordy Nelson and Randall Cobb were open all game. 7. Matt Forte, on the other hand, did get back on track. He was bowling over Packers defenders on a 23-carry, 122-yard day. 8. Rodgers reached 25,000 passing yards in 3,065 attempts, the fewest attempts in NFL history to reach that mark (Kurt Warner previously held the record at 3,076 attempts). 9. What a phenomenal play design on this Alshon Jeffery touchdown. Beautiful, Marc Trestman. The “Around The NFL Podcast” is now available on iTunes! Click here to listen and subscribe. Smarter Stats: What’s wrong with the Packers’ offense? Since he became the Green Bay Packers‘ starting quarterback in 2008, Aaron Rodgers has been one of the top quarterbacks in the NFL, if not the outright best when he’s firing on all cylinders. That’s not exactly a newsflash. From 2008-13 the Packers have finished out of the top 10 just once in overall yards (No. 13 in 2012), and overall points (No. 10 in 2010). But this season, they’re No. 27 in points and No. 28 in yards, and if you want more exotic metrics to gauge the size of the problem… well, Green Bay currently ranks No. 21 overall in Football Outsiders’ offensive metrics — No. 21 in the passing game, and No. 23 with their rushing attack. While some would like to know why second-year back Eddie Lacy hasn’t gotten off the ground as he did last year, most of the angst is directed at the passing game, designed as it is by head coach Mike McCarthy and run by Rodgers. True, Rodgers and the Packers have faced 3 straight good defenses, defensive lines, but this offense used to be better than good. They were great. And they’d still score 27+ points against good defenses regularly. The Packers miss Jermichael Finley at TE more than anyone really comprehends. Sure they won a Super Bowl with him in 2010, but they had Greg Jennings, Donald Driver, and James Jones back then. Using “career” defined as his career as a full-time starter, Rodgers’ career touchdown percentage is 6.3; this year, he’s at a career-low 4.9. His career yards per attempts is 8.1; this year, it’s a career-low 6.9. His career yards per game average is 256.6; he’s at a career-low 232.3 right now. You get the idea. If variety is the spice of life, McCarthy isn’t cooking anything to taste at this point. This season, per Pro Football Focus’ charting metrics, the Packers have run “11” personnel — one running back, one tight end and three receivers — on 76.6 percent of their plays, which is a huge uptick from years past, and a major increase over the league average of 51.4 percent. And it’s surprising, because in Green Bay’s offensive glory days under McCarthy, the coach was known as one of the most diverse playcallers from a formation perspective. The Packers would run everything from full house backfields with three running backs, to five-wide empty backfield formations in goal-line situations. Again, the trend has been severe. In 2013, per Football Outsiders’ stats, Green Bay ran “11” personnel on 68 percent of their plays. In 2012, it was 54 percent. ESPN Stats & Info has Green Bay with “11” personnel on 46 percent of their snaps in 2011, and just 35.6 percent of their snaps in 2010. So, over the last five seasons, you have one team running one formation more than twice as often as they used to, and formation diversity has gone right out the window. It’s something that’s very evident on tape, and it’s something that experts have noticed. Nelson gets a lot of double teams because he’s one of the league’s best receivers, but there are compounding issues this season — he’s not getting free off the line with the help of advanced route concepts, and Rodgers is targeting the daylights out of him. As Tom Silverstein of the Milwaukee Journal Sentinel points out, Rodgers is throwing to Nelson on 36.3 percent of the team’s passes, which leads the NFL. Fair enough if it works, but it isn’t working right now, and McCarthy used to can the “best personnel” idea in favor of schemes that would make everyone in the offense better. Whatever it takes to get the Packers back to that point, McCarthy needs to figure it out. ~The Packers offense is as healthy as they will be all season long. Healthy are all of their wide receivers, from number one down the line to number five Jeff Janis. All of their top three running backs are healthy in Eddie Lacy, John Starks, and DuJuan Harris. All of their top tight ends are healthy, still, in Andrew Quarless, rookie Richard Rodgers, and Brandon Bostick was back today as well, as evidenced by his two holding penalties. Bryan Bulaga was back at right tackle, and the rest of the starting offensive line was there as well. Perhaps center Corey Linsley isn’t as good as advertised, or as good as JC Tretter would have been. And Aaron Rodgers is healthy, as far as we know. Rodgers has looked terrible in both of his road games this year, for some reason. In 2 road games, Rodgers is 38-60, for just 351 yards, and 2 total touchdowns. He’s averaging a Brady Quinn-like 5.8 yards per pass attempt. The Packers have scored 23 total points in road games. At a Detroit team that was decimated in the secondary by injuries, and who lost their best linebacker early in this game in Steven Tulloch, the Packers might have been expected to roll in Motown, as they used to do. Rodgers had never lost at Detroit except the game he was concussed in the second quarter in 2010. Sure the Lion defensive line is good. They have been for a few years. Last week, the Jets brought a good defensive line to Green Bay. And Seattle in week one had defensive linemen flying all over the place, as they usually do. The problems with this offense, aside from the last two and a half quarters last week at home against the Jets, start with the offensive coordinator. Even last week, the offense came out flat. The team fell behind early. Nobody outside of the Packers front office and players know how much of the design and playcalling is actually Tom Clements, and how much is Mike McCarthy. Usually injuries are a valid excuse for many Packer problems, but this offense is as healthy as it will be all year long. It’s calling runs when the defense is looking for runs. It’s calling passes when -and how- the defense wants. Week one, Seattle took away the whole right side of the field as the Packers were afraid of Richard Sherman. Today, the Lions kept a safety over the top of Nelson all game long. This is the worst the Packers offense has ever looked since Rodgers too over. Perhaps it’s time to suit up, and unleash, Jeff Janis. I’m not sure if McCarthy should go back to scripting the first 15 plays. Something’s not right, and especially right out of the gate. But it’s more than just the beginning. Fans, and the Packers up-close, saw in week one at Seattle how effective a guy able to run the new “Jet Sweep” can be against NFL defenses. Percy Harvin hurt the Packers with it numerous times. He scored a touchdown on it last week at San Diego, and he also killed Denver in the Super Bowl with it. It’s a hard thing to defense, if you have a guy like that. Randall Cobb is like that. He’s not quite as strong of a runner as Harvin is, but he’s a good poor-man’s version of him. Plus, if you could imagine something “new” and “innovative”, Cobb also can throw it. He’s en emergency quarterback, and played the position sometimes in college. Are the Packers not aware of Cobb’s ability, do they not think they can teach and learn it, or are they saving it for the playoffs? At this rate, they aren’t going to make the playoffs. What were the problems today in Detroit? Well let’s start with the Packers offense’s first drive. Remember, the Lions got the ball first, and Dom Capers’ defense did a great job forcing a quick punt and gave the Packers the ball in good field position at the Packers 37-yard line. The first play was a basic run to Lacy, for a three yard gain. Nothing special, but positive gain and a nice 2nd & 7, which allowed options for the playcaller. So it was another run to Lacy. Both the first play and this play, the blocking was good and it didn’t appear Lacy got the most out of each’s blocking. Anyway, Nick Fairley popped the ball loose from Lacy, and the perfect simple bounce went right to the Lions defensive back Don Carey, who strolled in from 40 yards out for a quick touchdown and 7-0 Lions lead. Don Carey of the Lions scoops up an Eddie Lacy fumble and waltzes in for a 40-yard touchdown to put the Lions up 7-0 on the Packers opening drive. Rodgers got the ball back again, and McCarthy called a run to Starks, another run to Starks, and then on third and short, Rodgers threw deep on a fly to Cobb up the right sideline. Incomplete and a three-and-out punt. The defense for the Packers did a great job again, forcing a Lions three-and-out. Getting the ball back, the Packers offense on their third drive of the game, the Packers actually picked up a first down on a pass to Cobb for 9 yards on 3rd and 4.Then no gain to Lacy as the blocking was poor, then a miss to Boykin, and a sack on third and ten. Punt again. The defense would again respond as Ha Ha Clinton-Dix would get his first career interception, and the Packers first from any safety since 2012. This would give Rodgers the ball again, and the Packers would mount their first, and last, scoring drive of the ball game. A 59-yard drive would culminate on a great catch from a well-covered (and interfered with as the DB’s right hand was grabbing him) Andrew Quarless on a 10-yard touchdown. The next Lions drive would be a good-bad deal. The good is that Davon House made a beautiful interception on a deep pass intended for Calvin Johnson. House dove and made the catch as he was running towards the end zone, and he landed at about the half-yard line and of course the fast momentum carried him into the end zone, where he was touched for a touchback. But the replay zebra watched it in slow-mo, super slow-mo, and decided to give the ball to the Packers at the one-yard line instead of the 20 yard line as the on-field official called it. So first and ten from the one yard line, against a strong defensive line, you have to call a QB sneak there on the odd front and take your two yards, or you have to call a quick pass before Rodgers could get sacked for a safety or an offensive lineman would get a holding call. But Bob Schnelker called a running play to the right, to Eddie Lacy. It might have gotten a yard or two, but Richard Rodgers attempt at a block on 275-pound defensive end Jason Jones was absolutely disgusting, and he was blown back four yards into Lacy, causing the safety as then DeAndre Levy was able to come in and corral Lacy for the big two-point safety. Not only was it two big points, but it took the ball away from the Packers. Tight end Richard Rodgers gets blasted back into Lacy, stopping the running back for a crucial safety for the Lions. DeAndre Levy was the recipient of Rodgers’ weak attempt at blocking someone. That play made it 9-7, with all 9 points for the Lions coming against the Packers offense by the Lions defense. Those 9 points would be all they needed as the Packers ended the game with just 7 points. In the fourth quarter with almost 8 minutes left, the Packers mounted a drive, and had a 2nd and 1 at the Lions 16-yard line, down by just 12 points. Still almost 8 minutes remained, so a touchdown there and the Packers would have just been down 5, with the Packers defense having played well. A run off-tackle left to Lacy on 2nd and 1, but Lacy didn’t like what he saw there, and instead of putting his head down there and getting nothing or maybe a tough yard, he tried to bounce it back and outside to the left, and he lost 4 big yards. Now it became 3rd and 5. Rodgers missed Quarless and it was now 4th and 5. He went to Jordy Nelson on the right side, who ran a slant in the end zone, got a half-step behind linebacker Levy, and before the safety got over, Rodgers threw it to the open window, but a split-second late and it was incomplete, ball to the Lions and no comeback in store. No Favre last-minute heroics here. And to the bottom of the NFC North at 1-2, with the Vikings. Nelson got open but the pass was a bit late, so instead of a touchdown and a 19-14 score, it became Lions ball and still 19-7. Maybe Rodgers underestimated Nelson’s speed. DETROIT — Don Carey returned a fumble 40 yards for a touchdown, and Detroit’s defensive front smothered Green Bay on Sunday, leading the Lions to a 19-7 victory over Aaron Rodgers and the Packers. The Lions (2-1) came into the game with a secondary decimated by injuries, but that didn’t much matter with Rodgers under constant pressure. He was sacked twice and threw for only 162 yards, and Green Bay (1-2) wasn’t any better running the ball. Reggie Bush added a 26-yard scoring run in the fourth quarter for Detroit, which had never beaten Green Bay with Rodgers healthy for the whole game. The Packers managed only 223 yards of offense and lost despite forcing three turnovers. Detroit linebacker Stephen Tulloch left with a knee injury that appeared to occur as he was celebrating a sack. ~Derek Sherrod didn’t find out he had a shot at redemption until just before kickoff Sunday. Sherrod, the Green Bay Packers’ No. 1 draft pick in 2011, had some major struggles at right tackle filling in for the injured Bryan Bulaga in the Sept. 4 opener at Seattle. Bulaga, who tore his MCL in his left knee against the Seahawks, returned to practice this week, and the Packers were hopeful he could return to the starting lineup against the Jets. But following Saturday’s practice, Bulaga was put on the inactive list, allowing Sherrod to make his first NFL start. Sherrod was indifferent in assessing his day. Hard to believe, but the 2011 first round pick Derek Sherrod just made his first NFL start this week. Give him some time. He could, should, get better each week. Rodgers hopes so. He does need to run block more aggressively though. “Ah, it went all right,” he said. “I’m definitely glad we got the ‘W.’ We came together as a team and overcame adversity. And we were able to come out with the victory. Right guard T.J. Lang, from what he could tell, said Sherrod more than held his own. “I thought he was solid,” Lang said. “We didn’t have any communication errors. We were on the same page, and I thought he did a solid job. Sherrod was having some problems keeping his man away from quarterback Aaron Rodgers, and it appeared the Packers brought running back Eddie Lacy over to his side to help in the second half. The Packers’ offense got off to an inauspicious start when the center exchange between Corey Linsley and Rodgers was fumbled and recovered by the Jets’ Sheldon Richardson at the Packers’ 16. Five plays later, the Jets led 7-0. ~GREEN BAY, Wis. — At some point, Green Bay Packers quarterback Aaron Rodgers might need to start spreading the ball around. But not if Jordy Nelson keeps this up. One game after he was targeted 14 times, Nelson saw 16 passes come his way in Sunday’s 31-24 comeback win over the New York Jets. And it did not matter for a second that the Packers made no effort to hide the fact they were going to force-feed him the ball. Nelson, fresh off his four-year, $39 million contract extension this summer, torched the Jets for a career-high 209 yards on nine catches, including an 80-yard touchdown in the third quarter that turned out to be the game winner. With the Jets focused on taking away the Packers’ running game, they kept their base defense on the field even when McCarthy went to his standard three-receiver set — a personnel group that usually causes defensive coordinators to use their nickel package to get another cornerback on the field. That not only left Randall Cobb with a favorable matchup in the slot, either against a safety or a linebacker, but it gave Nelson more one-on-one coverage than usual on the outside. That’s exactly the coverage Nelson saw when he lined up wide to the right on first down from his own 20-yard line with 2:21 left in the third quarter. That time, he was the only receiver in what looked like a clear run formation. With the Jets in a one-high safety man coverage, Nelson ran a 10-yard out and when Jets cornerback Dee Milliner broke on the out route, Nelson turned it up the field. By the time safety Calvin Pryor came over, it was too late. Nelson already caught the ball at midfield and did the rest himself. “Jordy gives you those opportunities to really make some special plays,” said Rodgers, who threw for 346 yards, three touchdowns and registered the largest comeback (from down 18) of his career. It can be habit-forming to rely on one player, even one as good as Nelson. Sure, Cobb caught a pair of touchdowns, but he totaled just 39 yards on his five catches. Rookie Davante Adams had something of a breakout game with five catches for 50 yards after getting shut out in the opener against the Seahawks. The Seahawks did that to a degree — holding Nelson to 83 yards despite nine receptions in the Packers’ Week 1 blowout loss — but the Jets could not. It was all Nelson, whose 209 yards was the biggest day by a Packers receiver since Don Beebe posted 220 in an overtime game against the San Francisco 49ers on Oct. 14, 1996. At this rate, Nelson is on a 144-catch pace, which is about as realistic as the Packers throwing him to an average of 15 times per game. Before Sunday, Rodgers had never targeted one receiver 16 times in a game, according to ESPN Stats & Information, perhaps leaving it open to wonder whether the Packers have enough other options. But as Sunday’s game was winding down, there was Nelson with 194 yards receiving to his name, something Cobb reminded him. And when the Packers needed one more first down to complete the comeback, Rodgers, of course, went to Nelson, who came up with 15 more yards. “One-ninety is good, 199 is great but 200 just sounds better,” Nelson said. ~Eddie Lacy (concussion) got in a full practice on Thursday, and has been officially cleared for Sunday’s game against the Jets. “He looked great”, said coach Mike McCarthy after practice. At right tackle, Bryan Bulaga was out there again, but limited. I don’t expect him to start. I look for Sherrod to be out there. “Derek Sherrod needs to play better than he did in Seattle. He recognizes that,” McCarthy said. Linebacker Brad Jones (quad) did not practice on Thursday and seems unlikely to play on Sunday. Some might contest this is a soft way to bench the veteran. Others might say this quad is part of the reason Jones was at least a step slow last week in Seattle. Either way, a healthy Sam Barrington or Jamari Lattimore should be an upgrade. And it will be needed. The Jets are a strong running team. This sounds like a bad combination: The Green Bay Packers, coming off their season opener in which they missed 18 tackles, will have to deal with perhaps the most elusive running back from Week 1. Ivory broke more tackles than anyone last week, even on just 10 carries. Only the Saints missed more tackles than the Packers did last week. Add that up, and it’s either going to be another ugly scene out there, or else the Packers will have improved their tackling tremendously. On Sunday, they face running back Chris Ivory, who in the New York Jets ‘ victory over the Oakland Raiders on Sunday broke eight tackles. According to ProFootballFocus.com, Ivory was the NFL’s most elusive running back in Week 1. The eight tackles he broke came on only 10 rushing attempts, and he averaged 9.0 yards per carry after contact, giving him PFF’s highest “elusive rating” of the week. The energy & volume of work at today’s practice was excellent. I feel that we got better today preparing for the Jets. I thought Bostick looked much better today than he did yesterday. Bryan Bulaga was limited today, limited reps. He’s coming along. How he feels tomorrow & Saturday will be the final test. He said last year’s concussion was significantly worse than this one. I would agree as the hits were very different, and Lacy kept going after this one. Lacy also agreed that he might eventually need to change his running style, but not now. ~Right tackle Bryan Bulaga returned to practice Wednesday to give his left knee a test. How he did, and how he feels tomorrow will go a long way in determining if he will be able to play Sunday against the Jets. Running back Eddie Lacy was at practice but didn’t participate. It’s iffy whether Lacy will be able to play Sunday following the concussion he sustained last Thursday at Seattle. With this being Lacy’s second concussion with the Packers in a year (week two last year vs Washington), the Packers should err on the side of caution. They usually do, but in this case, they really should go with James Starks, DuJuan Harris, and Michael Hill off the practice squad, and let Lacy rest that head another week and bring him back in week three at the “undefeated” Lions. Tight end Brandon Bostick returned to practice for the first time since he injured his leg at St Louis on August 16th in preseason game number two. It remains to be seen if he’ll be ready for the game Sunday, but it was a good sign to see him back today. He adds an athletic dimension the Packers can utilize. It will be Greg Gumbel and Trent Green calling the game on CBS Sunday afternoon. Gametime is 3:25. The Jets are 3-1 all time at Lambeau Field. The Packers offensive line is going to have their hands full with the Jets defensive line, and blitz packages from Rex Ryan. I worry about Derek Sherrod on the right edge, again, but also the interior will face Sheldon Richardson, who’s fantastic. The Jets defense held the Raiders to 1.5 yards per rush last week, and that was the new supposed Dynamic Duo of Maurice Jones-Drew and Darren McFadden, also known as MJD and Run DMC. They didn’t run anywhere against these Jets except into the Gang Green Front 7. The Packers soft run defense, which starts in the middle, faces another test with the Jets. They have the physical Chris Ivory, who’s very similar to Marshawn Lynch, and they have Chris Johnson (CJ2K), who reminds many of Jamaal Charles. They are both dangerous and helped the Jets to pile up 212 yards on the ground last week on the Raiders, who thought they had a much improved defense. Even the bruiser Ivory had a long touchdown run. He’ll remind you of Lacy a little bit, minus the concussions. I’m still not sold on quarterback Geno Smith. But Rex Ryan says he’s come a long way since last season. Jordy Nelson expects to hurt the Jets. I see a Jordy Lambeau Leap in the game coming. The Jets can win this game. Here’s how. Week two dope sheets, whatever a dope sheet means. 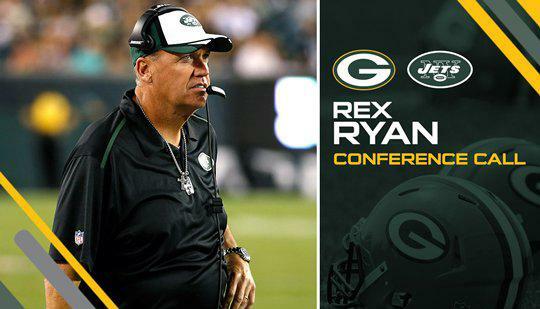 Here’s what Jets’ head coach Rex Ryan said about the Packers and the game Sunday. Jets hope to take a page out of the Seahawks playbook to beat Packers. Coach Mike McCarthy talked about the Jets game. Jets handled a new car last week, but could have issues with a Rolls Royce coming. GREEN BAY, Wis. — After spending the weekend reviewing the film of the Week 1 game in Seattle, the Green Bay Packers’ coordinators reflected on what went wrong in the 36-16 loss to the Seahawks. 1A. With your new 4-3 defense, how did it look in its debut? 1B. Do you plan to continue using the 4-3 defense this season? 2. Do you have to at least consider making a change at inside linebacker after Brad Jones’ performance in Seattle? 3. How did Ha Ha Clinton-Dix perform in his NFL debut? 1. Did Davon House do what he’s supposed to do by getting Richard Sherman to push him back into returner Earl Thomas? 2. Why did you remove DuJuan Harris from kick return after his second attempt? 3. Why did the team choose to use Randall Cobb on punt return again this season? 1. Why did Aaron Rodgers avoid throwing in Richard Sherman’s direction? 2. How can Derek Sherrod bounce back after his performance in Seattle? 3. Were you surprised at all that Corey Linsley made such a smooth transition to being the starting center?